At the opening of Z and Intec exhibition on February 23, PSG Plastic Service Group received an Innovation Award for its pipeLine hot runner system. 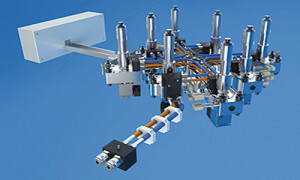 In a conventional system, each operating unit must be connected with four pipes, two for hydraulic and two for cooling. This makes an 8drop system with 32 pipes. 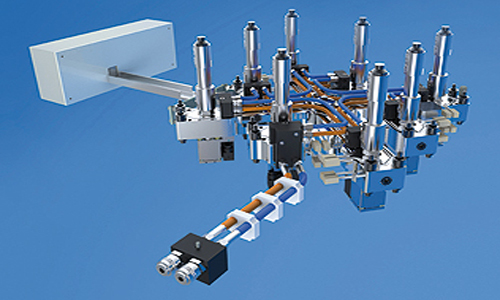 The new, patented pipeLine from PSG connects the operating units with only two pipes – a pressure line and a return line. Through PSG’s new concept, 80% of the pipes can be eliminated, thus occupying less space in the mold plate. This reduces machining work and increases the stability of the mold plate. The hydraulic oil moves the pin and cools the operating unit at the same time. This automatically eliminates the water treatment and the problem of calcification, PSG explained. The operating unit is switched by an electronically controlled valve. This guarantees a delay-free and precise control of the valve pin. Intec, the international trade fair for machine tools, manufacturing and automation, and its parallel exhibition Z was held from February 24-27 in Leipzig, Germany.